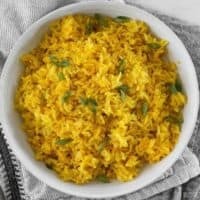 This savory Yellow Jasmine Rice combines warm and fragrant Indian spices and chicken broth to make the most flavorful rice you've ever tasted! Add the butter, garlic, turmeric, cumin, and cinnamon to a medium sauce pot. Sauté over medium heat for 1-2 minutes, or just until the garlic has softened. Add the dry rice to the pot. Stir and cook over medium heat for about 2 minutes to slightly toast the rice. You may hear a slight popping or crackling noise as the rice toasts. Add the chicken broth and bay leaf to the pot. Place a lid on top, increase the heat to high, and bring the pot to a rolling boil. As soon as it reaches a full boil, reduce the heat to low and let it simmer (with the lid in place) for 20 minutes. After letting it simmer for 20 minutes, turn the heat off and let it rest (do not remove the lid) for an additional 10 minutes. Fluff with a fork and serve. *I use Better Than Bouillon concentrate to make my broth, which provides plenty of salt to flavor the rice.